November | 2016 | Nicholas Hoffman & Co.
At our annual Women’s Investor Seminar, I like to use several slides that illustrate our belief in the discipline of long term investing in the stock market. The slides and information are fairly straight forward; please, allow me to illustrate. Here is the scenario: your Grandparents both invest $1.00 in the market in 1926, and then they forget about it. Grandmother invests her $1 in the stock market, as she was always told that is where growth was. Grandfather invests his $1 in the safer US Treasury bill market, because safety matters. Fast forward to 2009 and let’s see who has more money. Grandpa’s $1 has grown to $20.53, but Grandma’s $1 is now worth a staggering $2,592.00! The group of women at this year’s seminar was surprised at this result, but what shocked them even more were the possible consequences of Grandma trying to do some trading. If Grandma had traded in and out of the market, she would have likely missed some of the best performing months. If Grandma had been out of the market for the best 37 performing months during the period from 1929 to 2009, her $1 would have only grown to $19.66. In other words, missing the best 37 months of the market performance makes Grandma’s return worse than the return from US Treasuries. That’s pretty shocking, and it is a real demonstration of the power of staying the course. I was glad to read a recent research report from Merrill Lynch’s equity team that reached a similar conclusion. The Merrill team did a study of the stock market by decade starting in 1930. They looked at price returns of the stock market for each decade, and calculated how an investor’s return would have been affected if they had missed the best 10 days of market movement in each decade. Surely being out of the market for just 10 of each decade’s 3,600 days couldn’t possibly be that dire in terms of performance difference… or could it? As you can see, the impact on investor’s returns for missing either the best 10 days, or the best 37 months, is quite shocking! Some investment lessons are very hard to understand, but this one strikes me as very easy, and yet the reality is many investors find it hard to practice. Investors that stick to their plan and truly practice a strategy of being a long term investor should take comfort in these numbers. On the other hand, market timers should perhaps take pause. 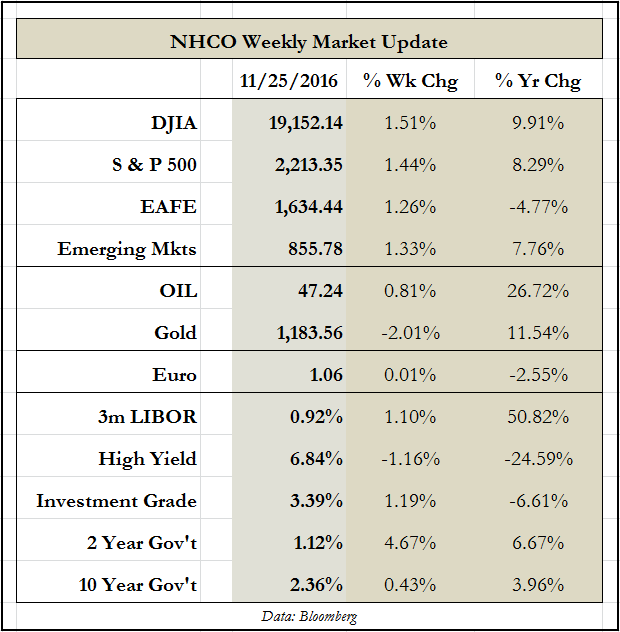 This entry was posted in The Weekly and tagged long term investing, stock market, trading on November 28, 2016 by nhoffmanandco.